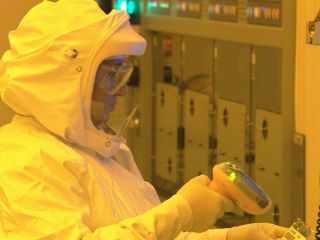 Intel plans to trade one type of silicon product for another when it breaks ground on a new solar cell manufacturing plant later this year. One of the major problems blocking solar cell evolution is efficiency - that is, converting sunlight into a decent amount of energy. But the entrance of a company of Intel's size into the market signals that this method of electricity production might be ready for the big time. Apparently, Intel has already got a number of customers lined up, and has secured a supply of polysilicon to make the things, which is obviously important as there is something of a shortage worldwide. Andrew Wilson, previously GM of Intel's New Business Initiatives group, will become chief executive of the new company. "The solar industry is akin to where the microprocessor industry was in the late 1970s. There is a lot to be figured out and improved," he said recently. He also said that Intel would be using a lot of the know-how it has gained working with silicon over the years to produce the cells, although the actual product will be vastly different. So, all you waiting for a self-powering processor might have to wait for a few more years then.